Egg-binding is a serious and often fatal condition that affects female birds of breeding age. Since it's so important for egg-bound hens to receive prompt medical treatment, owners should know what signs and symptoms to watch for in their pets. If left untreated, death can occur within hours, especially for the smallest birds. Egg-binding is when an egg takes longer than usual to pass out of the reproductive tract. This most commonly occurs in smaller birds like parakeets, cockatiels, lovebirds, canaries, and finches. Young birds reproducing for the first time and older hens are the most vulnerable to egg-binding. It can also occur in reptiles. Recognizing the signs of egg-binding early on is key to your pet's survival. If you observe any of the following symptoms, contact an avian veterinarian as soon as possible. The vet can properly diagnose your pet's problem and get it on the road to a fast recovery. Rapid or labored breathing: Many egg-bound hens look like they are having a hard time breathing. Even slightly labored breathing is a symptom of egg-binding. Swelling: An egg-bound hen may appear to have a swollen stomach or show swelling around her bottom from straining to pass an egg. Birds with swelling on any part of their bodies should be seen by a medical professional as soon as possible. Constipation: If you suspect that a hen may be egg-bound, watch her droppings. You should assume there's a problem if they look abnormal or if she fails to produce any at all. Fluffed-up feathers: One of the most common symptoms of illness in birds, fluffed-up feathers can also be a sign that a bird is egg-bound. 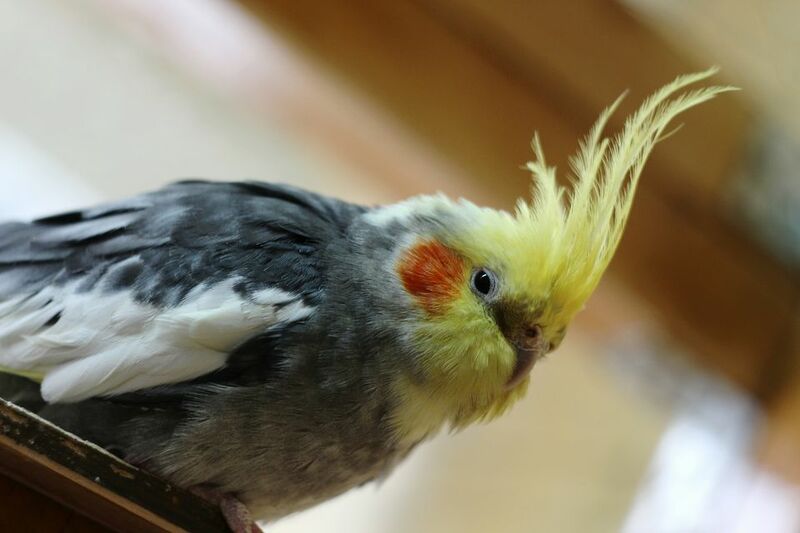 If you observe your bird sitting with her feathers fluffed up, assess her for any other symptoms or abnormalities. Straining: Egg-bound hens often visibly strain to try and pass their eggs. Egg-binding should be suspected in birds that strain but show no progress in moving their eggs. Sitting on the cage floor: Most of the time, birds that are egg-bound tend to sit on the cage floor. Eggs that are stuck inside of a hen can put immense pressure on the bird's spine, sometimes causing paralysis and the inability to perch. Drooping of the wings: Canaries might exhibit this symptom the most. Lameness: This occurs when the egg puts pressure on the nerves going to the legs. Loss of appetite: This is a common symptom of several illnesses, but if you notice your bird is not eating, assess it for other signs of egg-binding. It's hard to determine the exact cause of egg-binding. Some may be due to the bird's age, as young birds laying eggs for the first time and older birds seem to be more at risk. Other potential causes include an obese hen, a sedentary lifestyle, nutritional issues such as calcium deficiency or low protein diets, stress from the environment, or a malformed egg. It is a reasonably common condition. A bird suffering from egg-binding should be seen by a veterinarian right away. They can help determine if the egg is stuck far inside or near the cloaca. It is possible for a bound egg to be massaged out. This should be done by a vet or an experienced pet owner. Another option is a warm water bath or even a steam room. This can help relax the muscles, which may help the hen pass the egg on its own. If the massage and natural methods don't extract the egg, it may be necessary to break the egg while it is still in the hen and remove it in parts. If this occurs, the vet will use a needle to remove the contents of the egg, which will cause the egg to collapse. The vet will then clean the hen's oviduct to remove any shell fragments or egg residue. Leaving anything in the hen could lead to infection or internal tissue damage. Another option is for the vet to use an injectable drug, which may help cause the oviduct to contract and expel the egg. Upon examination, the vet will determine the best course of action. Since egg-binding is a common condition, it is hard to completely prevent it. It's best to maintain a healthy lifestyle for your hen, with proper nutrition and a life free of environmental stressors. Keeping daily watch on your hens will help you know their habits and be better aware if they are displaying any symptoms of egg-binding. Is a Talking Bird the Right Pet for You?